C. striatula Michx. Fl. Bor. Am. 2: 173. 1803. 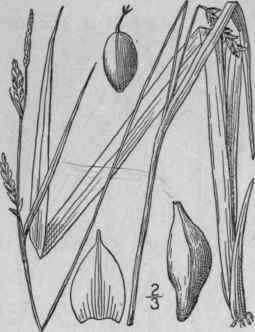 Carex laxiflora var. 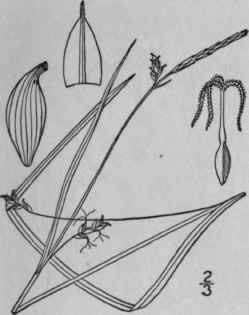 divaricata Bailey, Mem. Torr. Club 1: 33. 1889. 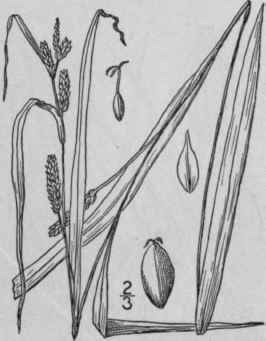 Glabrous, pale green, culms loosely caespitose, nearly smooth, triangular, little flattened, erect, 1°-2° high. Leaves shorter than culm, 3 1/2"-6" wide; bracts short, usually exceeded by culms; staminate spike solitary, usually long-stalked, its scales commonly reddish-brown tinged; pistillate spikes usually two, widely separate, erect, peduncled, linear-oblong, 6"-15" long, closely or at base loosely 6-20-flowered; perigynia obovoid-fusiform, divergent, obtusely triangular, strongly nerved, 2"-2 1/2" long, 3/4" wide, tipped with a straight or slightly oblique conspicuous beak; scales broadly ovate, short-cuspidate, hyaline-margined, slightly reddish-brown tinged, shorter than perigynia; stigmas 3. New Jersey and Pennsylvania to Florida, Tennessee and Texas. April-June. Carex styloflexa Buckley, Am. Journ. Sci. 45: 174. 1843. Carex laxiflora var. styloflexa Boott, 111. 37. 1858. Glabrous, culms rather loosely caespitose, slender, triangular, often purplish at base, smooth, 1°-2 1/2° tall. Leaves 1 1/2"-3" wide, flat, shorter than the. culm; bracts short, usually exceeded by the spikes; staminate spike solitary, usually long-stalked but sometimes nearly sessile, its scales usually reddish-brown tinged; pistillate spikes 1-4, distant, loosely 4-12-flowered, 5"-10" long, the lower drooping on elongated filiform stalks; perigynia elliptic-fusiform, triangular, many-nerved, 2"-2i" long, \" thick, somewhat divergent, tapering gradually to both ends and thus slender-beaked, the beak straight or little oblique; scales ovate or ovate-lanceolate, scari-ous-margined, reddish-brown-tinged, acute, cuspidate or short-awned, shorter than the perigynia; stigmas 3. In woods and thickets, Connecticut to Florida and Texas. Carex Haleana Olney, Car. Bor. Am. 6. 1871. Not C.
322. 1896. Carex Shriveri Britton, Manual 208. 1901. Glabrous, light green and slightly glaucous, culms slender, erect, smooth or nearly so, 6'-2° tall. Leaves flat, 2 1/2"-8" wide, the basal shorter than the culm; bracts similar to the leaves, the lower rarely equalling the culm, strongly sheathing; staminate spike solitary, sessile or nearly so; pistillate spikes 2-5, distant, or the upper two contiguous, erect or somewhat spreading, linear-oblong, 3 1/2"-14" long, 2"-2 1/2" thick, densely 15-50-flowered, the lower at least exsert-peduncled; perigynia narrowly obovoid, little swollen, circular in cross-section, not strongly nerved, ascending, about 1" long, 3/4" wide, contracted into a minute, usually entire, straight or rarely slightly bent beak, or essentially beakless; scales narrowly ovate, thin, acuminate or cuspidate, much shorter than the perigynia. In moist meadows. Maine to North Dakota, Virginia and Indiana. May-July.